When choosing the Windows 10, you have a choice between Windows 10 Pro Version and Windows 10 Home Version! Windows 10 Home is similar to the Windows 7 Home Premium and the Windows 8 Home Version! 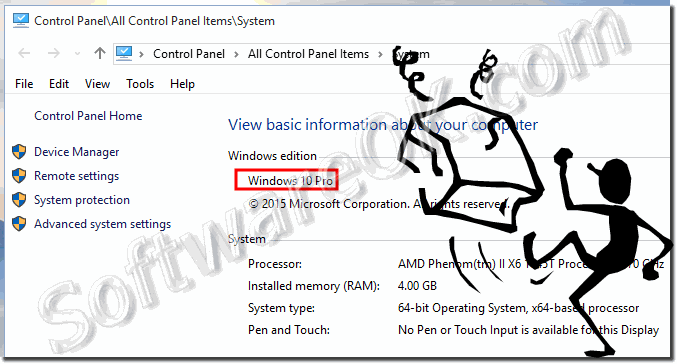 Windows 10 Pro is similar to: Windows 7 Professional / Ultimate, or Windows 8.1 Pro version. The Windows 10 Home Edition: Is well suited for daily work and absolutely sufficient for standard users and gamers. The Windows 10 Pro Edition: Is suitable for power users, developers and corporate networks. ... what is the difference between Windows 7 Home, Professional, and Ultimate? ... which version of Windows 8 is right for me? (Image-1) Windows 10 Home or Pro! Windows-10 - FAQ-87: Windows 10 Home or Pro version? To allow the remote desktop connection to Windows 10 PC, of course the remote connection must be activated / enabled on the Windows 10 operating system. Windows, 10 home or pro range? Assortment home or profesional windows 10? Variety windows 10 home or profesional? Choosing windows 10 pro or home Version? Eligibility windows 10 pro or home Version? Choice windows 10 home or pro? Selection windows, 10 home or pro? Windows 10 pro version versus windows 10 home Version?